The power behind iMobiTrax is our reporting interface that allows you to instantly identify important conversion metrics such as Manufacture, Name, Model, Combined Name, Marketing Name, Type, Operating System, Display Size, Resolution, and Data Speed, Referring URL, IP Address, Carrier, Internet Service Provider, Country, and any user-defined custom Tokens. We also offer the ability to view conversion by day of the week or time of the day. All of these reporting metrics can be grouped to narrow down exactly where the return on investment exists. The manufacturer of the device that clicked your advertisement is instantly shown. Discover the devices that are converting and click through your campaigns and the ones that do not perform. Instantly viewing this metric allows you to return to your advertising network with a plan of action on how to scale and optimize to make the most out of your campaign. The name of the device that clicked your tracking link (ie: Galaxy S II). The name used in marketing by the device manufacture that clicked your tracking link (ie: Samsung Galaxy S (GT-i9000)). The type of device that clicked your tracking link (ie: Android, Feature Phone, etc.). 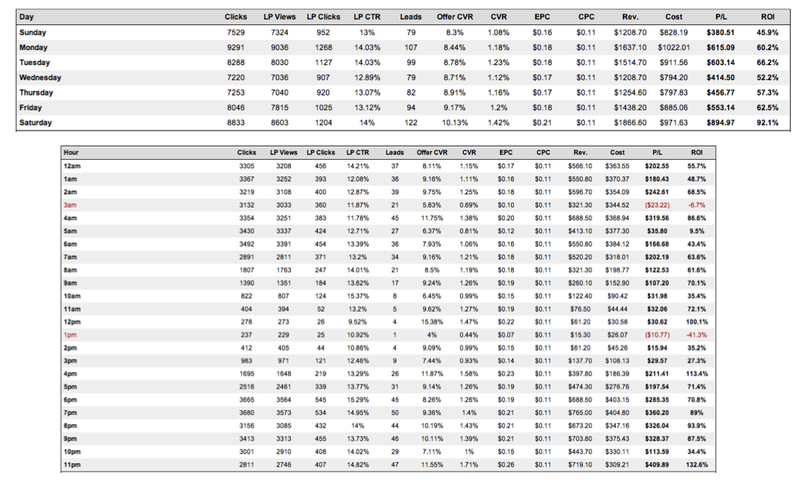 View all of your click/conversion data by the device operating system. Quickly identify the exact version of the operating system your traffic is using and which versions convert the best with your particular campaign (ie: Android 2.3.5). The exact display size of the device that clicked your tracking (ie: 4.0). The maximum screen resolution of the device that clicked your tracking link (ie: 480 x 800). The network speed that the device is capable of that clicked your tracking link (ie: 3G, 4G). Instantly see where your mobile traffic is coming from. While some mobile devices do not pass a referring URL, some will show you exactly where your visitors are coming from. This allows you to go back to your advertising network and collaborate with them on the sites that perform the best for your campaigns. Instantly view the IP address and identify carrier ranges from the traffic you’re purchasing. A very useful metric to target out clicks at your source that aren’t converting. The carrier that the device was browsing on when your tracking link was clicked (ie: Verizon, AT&T). Even though a device is assigned a certain carrier at times the user could be browsing on a Wifi connection. This will allow you to identify what network the visitor was on when they clicked your tracking link (ie: Road Runner). The country the user was in when they clicked your tracking link (ie: United States). Inside the reporting interface you’re able to view the custom tokens you setup during the campaign creation process. Quickly sort and organize campaigns to see the custom items you have declared to find hidden ROIs and areas that can be eliminated allowing for maximum optimization (ie: site placement, creative id). Mobile campaigns perform differently depending on the hour of the day or the day of the week. To help you optimize and scale, iMobiTrax offers the ability to see the exact time and day of the week that conversions yield the highest return on investment. Eliminate the hours/days of the week that do not yield a positive return and scale during the hours/days that perform the best.